A weir is basically an obstruction in an open channel flow path. Weirs are commonly used for measurement of open channel flow rate. A weir functions by causing water to rise above the obstruction in order to flow over it. The height of water above the obstruction correlates with the flow rate, so that measurement of the height of the flowing water above the top of the weir can be used to determine the flow rate through the use of an equation, graph or table. The top of the weir, which is used as the reference level for the height of water flowing over it, is called the crest of the weir. Weirs are typically classified as being either sharp-crested or broad-crested. This course is devoted to the more widely used sharp-crested weir. The major emphasis is on the calculations used for flow rate over various types of sharp-crested weirs. There is also information about guidelines for installation and use of sharp-crested weirs. This course is intended for hydrologists, civil engineers, hydraulic engineers, highway engineers and environmental engineers. An attendee of this course will gain knowledge about calculations and installation & measurement guidelines for sharp-crested weirs as used to measure flow rate in open channels. Upon completing this course, the student will be prepared to study additional open channel flow measurement topics. 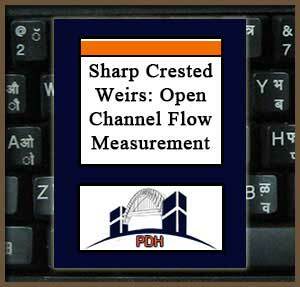 Be familiar with standard terminology used in connection with sharp-crested weirs for open channel flow measurement. Be able to use the Kindsvater-Carter equation to calculate the flow rate over a suppressed rectangular weir for given head over the weir and weir dimensions. Be able to use the Kindsvater-Carter equation to calculate the flow rate over a contracted rectangular weir for given head over the weir and weir dimensions. Know the conditions required in order to use a simpler equation instead of the Kindsvater-Carter equation to calculate the flow rate over a suppressed rectangular weir and over a contracted rectangular weir for given head over the weir and weir dimensions. Know the conditions required in order to use the equation, Q = 2.49 H2.48, to calculate the flow rate over a V-notch weir for given head over the weir and weir dimensions. Be able to use the Kindsvater-Carter equation to calculate the flow rate over a V-notch weir for notch angles other than 90o, given head over the weir and weir dimensions..
Be familiar with installation and use guidelines for sharp-crested weirs for open channel flow measurement.